Thermal And A Quarter were in town last night at Firangi Paani. 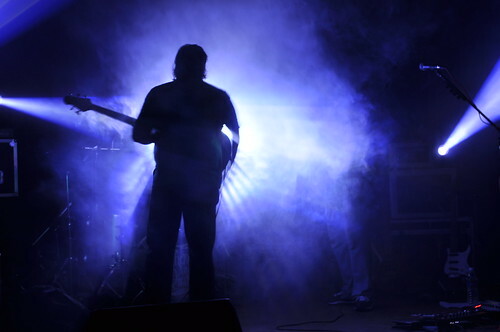 And they were so awesome that this is the first blog post I’ll be doing for a band, considering the fact that I’ve been for shows like Iron Maiden, Porcupine Tree, Joshua Redman and various other shows. The reason for this is these guys have the potential, the skill… Putting it in other words this band begs to differ using their unique set of skills (IT’S TIME FOR US INDIANS TO SHINE ) It’s not the same old usual stuff/covers what everyone out there is replaying. Secondly, the whole world is following existing musicians; very few like TAAQ are differentiating with a very thin line which is really, REALLY awesome. Thirdly, India has to start creating its mark on the world by fabricating something diverse/different. For example, at last night’s show there was this song (Look At Me) where Bruce improvised vocals with “balle balle” and other songs like Jupiter Cafe where he uses ragas — which is awesome (trust me on this one). Every song performed by them was gripping the crowd. I was standing right in the front of the stage all-show-long. LOL! They played unexpected stuff like Hey Jude (The Beatles), a jazzy cover which was a simple jaw dropper. Right after a few songs I happened to ask someone if Bruce takes classes anywhere, and I was surprised to hear that there is a TAAQademy, I was expecting a sarcastic answer like: YEAH RITE!! BUT HE TAKES CLASSES!! Unfortunately, they have them only in Bangalore. Overall a very lively band to be catch! I can today say that even if you haven’t heard even a single song of TAAQ you still should catch them live and you would love it! A friend of mine once said that if you take all the Mallus (all in good spirit…: D) out of Bangalore, you’re not gonna be left with a single band in the whole city. So when you have three and a quarter (well, not anymore though) of them coming together to make music, you are bound to be transported to a whole new world of eclectic music. Hyderabad had its tryst with the Bangalore (yes, no Bengaluru for me) Power Trio Thermal and a Quarter on September 7. The venue… er, well let’s not talk about that. The “Only Couple Entries” sign is not very welcoming to a rock audience and I had to sorta impose the situation on my friend Priyanka (Thank you so much)… Yes, I was not going to miss this for anything in the world! Bruce Lee Mani, which is he better at exactly – singing or guitaring? ?… Tight throughout as usual, TAAQ provided a brilliant ambience to an otherwise below average pub. Be it the bluesy new number Grab Me “a Boost in the mug with no happy encore”, a teetotaler’s delectable intrigue against the upbeat “I’m drunk… I’m stoned… I’m high… I’m done” or the groovy Mighty Strange speaking about the heavily dependent IT world or their ever-popular song, the jazzy funky Paper Puli, they were all excellently textured to satisfy us all. “We come from Bengaluru, earlier known as Bangalore. You guys come from Andhra Pradesh and you don’t know what it’s gonna be called very soon… This is something you should have done a year back”…oh yes, it was time to Shut Up and Vote. The latter part saw Where The State Has No Name, a grim reminder of the political hullabaloo in the state. Oh, and of course, we were also entertained to the ‘Thermalised’ versions of Hey Jude, Wonderwall and Hoedown. Well, our thirst was quenched by the Thermal range of the music… for here before us stood a band which has championed the cause of original music when the whole country was still reeling under the shades and tunes of repetitive covers and also went ahead to make a mark supporting various social causes and to put the icing on the cake, came up with the stunning world class TAAQADEMY. So next time when these True Messiahs of Indian Rock decide to drop in your city be sure to fix an appointment and taste the sparkling shot of TAAQuila!! P.S. Word around the pub was that the number of Bruce Lee jokes had exceeded those of Rajnikanth and Chuck Norris…Ladies and Gentlemen, we have a new hero!!! Being in college, going out to Hard Rock Cafe is something that one has weigh the pros and cons of very carefully. But when TAAQ is playing at Hard Rock, it’s a no-brainer. You know that you’re going to get your money’s worth. In fact I think it’s a steal! Thermal And A Quarter, in my opinion, is one of the most professional bands I’ve ever seen live! Thursday night was no different. Now I’ve been to a lot of TAAQ gigs, but every show is just awesome. Now to the originals, what can one say, every single one is just a trip. TAAQ always likes to change things up. To get in Mr. Ravichandra Kulur on the flute was stroke of genius! The flute fell seamlessly into the tweaked version of ‘One Small Love’ and played its part in that sweet song. It was also nice to hear Bruce’s guitar fills for ‘Paper Puli’ on the flute. Rajeev’s drum patterns on ‘Surrender’ almost make you want to dance. I miss Rzhude a lot, but Prakash seems to be right at home with the band and puts in some really groovy bass lines. He puts in some interesting solos as well. Great to see the overall vibe of the band still being the same . But missed Jason on the keys and the backup vocals. And Bruce, is he a guitarist who sings, or a vocalist who plays guitar? One of life’s great mysteries. His guitar tone is superlative through all their songs, whether it be ‘Simply Be’, ‘Respectable’ or ‘Drunk’. He has the crowd eating out of the palm of his hand, with his signature witty response to random drunk comment or gesturing to the crowd to sing softly, as though turning the volume down on a radio! The two new originals were great (one was ‘Clean Up’ I think). Thanks to the band for releasing ‘Grab Me’. Perfect for bluesy nights. But please, for god’s sake come out with a new album fast! ‘Ordinary Affair’ and ‘Chameleon’ (just to name a few) are just addictive! My favourites for the night were ‘Hey Jude’, ‘Grab Me’ and ‘Chameleon’. But I like all the songs because it’s so nice to see a band absolutely love what they are doing! Another trademark is the smile on the face of each one of them on stage. Great job guys! See ya at the next gig. It was an evening that can never be forgotten. I was passing by the auditorium at St. Aloysius after my recording at Radio Sarang when I incidentally heard some music emanating from the auditorium. Intrigued, I went to have a closer look, and I was surprised to see three people practicing and performing sound checks. On further inquiry, I came to know that TAAQ was performing at the auditorium that night. Ooh… This was something I couldn’t afford to miss! The concert started off with a small crowd, most probably due to the lack of proper publicity, but the music was astounding nonetheless. This was the first time TAAQ was performing in Mangalore, and quite a few people were curious as to know how a trio can handle an entire concert. But this trio more than just handled the concert; they rocked it! Surprisingly, the crowd consisted of not just youngsters, but many elderly people were seen enjoying the music as well. The crowd was all in cheers for the concert! Personally, I was mesmerized by the music and was in a sort of trance, and I’m not overhyping things. This was the ground reality, which I’m sure that the entire audience would agree with me. Also the TAAQ team maintained a good rapport with the audience, thereby involving them further in the music. •	TAAQ Team succeeded in getting the crowd involved. •	Mangalore got to hear awesome compositions by TAAQ. •	Excellent Sound and Lighting systems. •	Being a weekday was maybe one of the causes for low turnout at the concert. •	Lack of publicity of the programme in Mangalore, because many of my friends said they were interested, but had no idea that the concert was going on. Like I said, 6th July 2010 was an evening I’ll never forget. And I’m eagerly waiting for the day TAAQ comes back to Mangalore with another mesmerizing show! Cheers! This review is coming from someone who just attended his first Thermal And A Quarter concert just about a week ago, in Mysore. My sincerest apologies to the fans who might find this incomprehensive. Reason I was in Mysore in the first place owes to my being in charge of selling the taaq merchandise (the t-shirts by the way are an absolute must have for every taaq fan, contact for details). The band had the crowd wrapped around their finger right from the very first song, Sorry for Me, which they happily dedicated to the Argentina, the losing team of that day’s football match! They then went on to play ‘Grab Me’, ‘Ordinary Affair’, ‘Respectable’ and a dozen more of their best numbers. Listening and watching them play, you can see why the audience instantly fell in love with them… it’s really hard not to, their music is a mighty strange mix of originality with a sense of familiarity. By the end of the show, the crowd was a little too infected with TAAQ’s music to simply let them leave. The band was forced to oblige and played for a good half hour more, with songs like ‘Motorbyckle’ (my personal favorite) and finished it off with ‘Paper Puli’ (their greatest hit, so to speak). Which was a bad idea really, because the crowd decided continue their protest with renewed vigor! But it had to come to an end this time, there were curfews to keep up and autographs to sign! The Alliance Francaise was packed to the rafters on Sunday evening for the TAAQ gig. But some folks out there were taking notes. Aswin Nandakumar sends us his take (for the record, it’s his first-ever gig review). We’re honoured, Aswin. Thanks! The music they breathed out at Alliance Francaise (with the new bassist) was entirely unpredictable. It might be a naïve comment, but it’s been ages since I last attended a TAAQ concert. I am talking about ‘those times’ when they used to belt numbers from Plan B. I must say their enthusiasm for their live craft to play is grand with likeable degree of energy. Their music did the talking. There was a festival atmosphere in the Alliance as they rendered all new tracks keeping aside their most peppy hits. Fans gazed into each other’s eyes with the expression “OHoo… Wowwiiee” as the new bass guitarist Prakash on his debut performance plucked, stroked and strummed with great ease and grooved so well with Rajeev (drums) and vocals. The gig was short as they played just less than half a dozen songs. ‘Ordinary Affair’ and ‘Surrender’ were my personal favorites. I was also pleased with their intention to write the song the ‘Where the state has no name’, which sang about the “geographical divide” situation in Andhra Pradesh. I just hoped they would play ‘One Small Love’ with the video flashing in the background. Perhaps more pleasing to the impartial listener might have been the Beatles number ‘Hey Jude’. On request from an unknown shout from a fan who probably would have come to sing along with Paper Puli, Bruce humbly replied, “No. All new songs today.” And his request to the sound guy: “Give him (Prakash) whatever he wants” added fun to the gig. Backup vocals/seconds (God knows how Bruce did that) was timely and limited just like the number of t-shirts they had for sale! On a lighter note, I was wondering if TAAQ would tell their newbie to trim off his metal look! The TAAQ concert at Alliance Francaise was a fine breeze. It was pleasant and engaging. TAAQ serious followers were all there! It came as no surprise as half of the crowd left the Alliance with them. It’s great to to see TAAQ find equilibrium at 3 yet again!